How do you tell a story in pictures when all you have is light and shadow? Magic Lanterns: the original picture theatre, a magic lantern. A magic lantern is a means of illustrating a story. Nothing more, nothing less, and nothing short of magical. More than a slide show (banish all thoughts of boring Powerpoint presentations – the worst I’ve seen include spreadsheets that look like tartan), a magic lantern show is theatre, with elements of Punch & Judy, Indonesian shadow puppetry and a spot of what-the butler-saw. In fact, the peep-show machines of popular culture were direct descendants of the magic lantern. Magic lanterns played an important part in the development of photography, but especially of the cinema. The first narrative films (the link does a great job of explaining how the scenes in the film combined to tell the narrative) show stories in much the same way, with musical accompaniment and sign cards to tell the audience what’s going on. This makes the storytelling even more important, not less. The flash-bang of modern CGI and special effects has a tendency to reduce the story to a background noise against which to display big fiery explosions or Sandra Bullock drifting off into space. With a simple set of cinematic tools, for example The Call of Cthulhu, you’re reduced to the bare minimum of distractions from the story. Just like a magic lantern show. The magic lantern man played an important part in the lives of distributed communities, along with other commercial travellers – salesmen, tinkers, knife-grinders, nonconformist preachers – who brought news from other places and spread the word about your own home town. The magic lantern isn’t a sophisticated piece of equipment. At its most basic, it’s a slide projector. In the hands of an accomplished entertainer, however, the magic lantern show becomes a thrilling adventure, a horror story, a sweet romance. Anything, in fact, that a story is. Magic lanterns were part of the landscape in the world of 1832 in which I set my novel, SHADOWBOX. The population at large would have been familiar with the figure of the man with the box on his back, and regarded his arrival in their community with delight and excitement (think how the hobbits welcome Gandalf in Hobbiton at the start of LOTR, before Bilbo’s party). 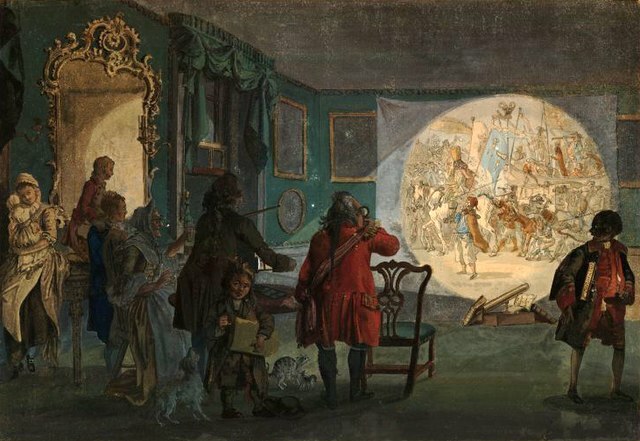 Even in the cities where entertainment was widespread, cosmopolitan and less personal, a magic lantern show was a popular entertainment. The opportunity to sit in the dark in mixed company – ain’t it always popular? Magic lantern men still perform at folk festivals and steam fairs across the country. You’ll find them at the Dorset Steam Fair and the Durham Miners’ Gala. 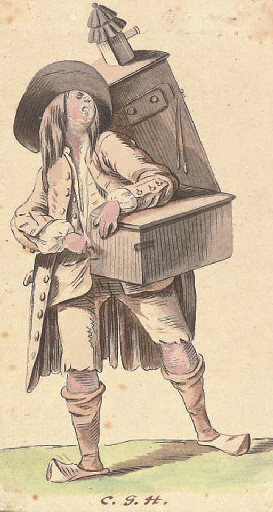 In an era where most people find their news and entertainment online, remember the man with the box on his back who walks from village to village, sharing stories we’d recognise today regardless of what else is missing in 1832. Next post in the SHADOWBOX series: What’s Missing In 1832.